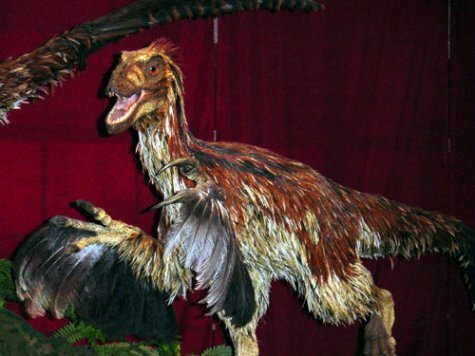 Despite the fact that no evidence of feathers has ever been found associated with a Deinonychus fossil, this model of the dinosaur at Canada's Royal Ontario Museum is covered with feathers in an attempt to emphasize the supposed evolutionary relationship between dinosaurs and birds. Dr. Alan Feduccia is a world-class evolutionary biologist whose research has focused on the natural history of birds. He is the S.K. Heninger Distinguished Professor Emeritus at The University of North Carolina, Chapel Hill, and even his abbreviated list of publications is the envy of most scientists. He has received numerous honors for his scientific accomplishments, including having an extinct species of bird named after him: Confuciusornis feducciai. Despite his incredible scientific accomplishments, he is ridiculed by some in the scientific community because he doesn’t think that dinosaurs evolved into birds. There are those who call him a “BANDit” (BAND stands for “Birds Are Not Dinosaurs) and lump him in with the hated creationists and the global warming “deniers.” Why don’t these people listen to a man who has contributed so much to the biological sciences? Because they follow the consensus, and the consensus is that birds evolved from dinosaurs. Anyone who questions this consensus, regardless of the data they present, are simply ignored and ridiculed. I couldn’t agree more. When you hear the word “consensus” used to support a scientific argument, you know the speaker has stopped thinking. Rather than examining evidence for himself or herself, the speaker is simply allowing the majority to rule. Majority rule might be a good system in some social applications, but it is the worst possible method for doing science. While Dr. Feduccia does spend a few pages attacking the “herd mentality” that seems to be predominant in science, he spends most of his time laying out his case for why birds could not have evolved from dinosaurs. Now don’t misunderstand. Dr. Feduccia is not claiming that birds didn’t evolve. He just thinks the latest fad that states they evolved from dinosaurs is indefensible based on the data. He suggests that birds probably evolved from an archosaur lineage, which is thought to have predated the dinosaurs. Thus, he thinks that dinosaurs and birds have a common ancestor, but he doesn’t think that dinosaurs are in the evolutionary line that produced birds. If these “protofeathers” are supposed to have kept dinosaurs warm, how did the dinosaurs keep them dry? Now once again, don’t misunderstand Dr. Feduccia’s position. He is no friend of creationists. Indeed, in the early pages of the book, he says that the “birds are living dinosaurs” dogma is so nonsensical that it is providing a lot of fodder for the creationists, and he doesn’t like that. However, he is experiencing what creationists, intelligent design advocates, and those who fight against the “consensus” in many other areas of science have experienced: His arguments are ignored and the data he presents are discounted because his view is not a part of the current scientific dogma. While the book is very technical, it is well worth a read for anyone who is interested in the supposed evolution of birds. If nothing else, it will show you that the current “birds are living dinosaurs” view is not supported well by the evidence, and it will give you insight into how even a well-respected scientist can be ostracized when he or she decides to go against the scientific dogma of the day. This would be truly exciting stuff if it wasn’t so sad. Perhaps this will give the Holy Spirit an inroad to helping this man recognize the truth; although he’d have to be willing to let the rest of his reputation go. It will be a pleasure to add this to my list of suggested reading on “feathered dinosaurs”. Thanks for taking the time to keep up with all the eye-crossing research and reports out there for us. I think the reputation factor is very big, Cheri. If you’ve spent your life arguing for something, will you really allow yourself to be persuaded by the data to believe something else? Some will. Most won’t. I recognize for the secular or Christian “evolutionist” the most difficult of all issues isn’t the so called “facts” of evolutionary science but rather the ridicule, slander, mocking that comes with any dissension that goes against popular opinion. Historically going back to Newton and Galileo this has been where all the greats of science have found themselves, whether as Christians they found themselves at odds with the “Church” or with secular scientist. I think consensus does have a place in science if we define consensus as a temporary position of most scientists which is subject to change in the future. Of course, there will always be an anti-consensus which consists of varying factions opposed to the consensus. Another problem is that some people think that their ideas are the fixed, unchanging truth which will also look like a consensus. If the consensus will only acknowledge that it could be wrong (upon further investigation) then we can work with it. And that’s the key. Can we work with each other? I am under no conviction that the various claims to Truth can or will work with each other to achieve even better and more accurate claims to truth. That’s a very healthy view of consensus, Scott. I do think that’s what Dr. Fedducia is arguing for. His main point is that consensus should not count as evidence. Homeschool: The Best Setting to Teach Science Want to Lose Weight? Ask Your Bacteria for Help.